Pablo Barrios and G&C Quick Star 11 won the $40,000 Surpass Grand Prix, CSI 2* during the second week of the 2011 FTI Winter Equestrian Festival. Photo © Sportfot, Official Sport Photographer of the FTI Winter Equestrian Festival, www.sportfot.com. 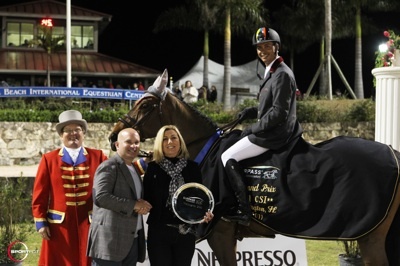 Wellington, FL - January 29, 2011 - Pablo Barrios (VEN) and G&C Quick Star 11, owned by G&C Farm of Wellington, FL, captured the top prize in tonight's $40,000 Surpass Grand Prix, CSI 2*. This was the second event of 11 in the "Saturday Night Lights" series at the 2011 FTI Winter Equestrian Festival (WEF). A crowd of 4,700 spectators were there to enjoy top-class show jumping and all that the Palm Beach International Equestrian Center has to offer. The third week of the FTI WEF concludes with tomorrow's competition. The 2011 FTI Winter Equestrian Festival has 12 weeks of competition through April 3, 2011, and they will be awarding more than $6 million in prize money through the circuit. This week's course designer in the International Arena is Olaf Petersen Sr. of Germany. There were 41 entries in the grand prix, and 12 were able to keep all of the jumps up to advance to the jump-off. Schuyler Riley described of the course, "The first round was a beautiful course. Rails fell everywhere. It was a very technical, precise-riding course." The first to return in the jump-off was Quentin Judge (USA) on HH Calvano, owned by Double H Farm. They had four faults in 42.22 seconds to finish in sixth place. Brianne Goutal (USA) and Onira, owned by Remarkable Farms LP, were just slightly slower in 42.26 seconds, also with four faults, and they picked up the seventh place ribbon. Eric Lamaze (CAN) and Artisan Farms LLC's Sidoline van de Centaur had eight faults in 44.88 seconds for 11th place. Barrios and G&C Quick Star 11 were next in the ring and set the time to beat with a clear round in 39.87 seconds. The typey mare, who jumps in a hackamore, kept the pedal to the metal throughout and was very efficient through the turns for the win. Ljubov Kochetova (RUS) and Royce were also clear, and their time of 45.42 seconds slotted them into fourth place. Christine McCrea (USA) with Baloubet Junior Z, owned by Candy Tribble and Windsor Show Stables, had a rail in 42.39 seconds for eighth place. Riding Lionshare Farm's Select, Peter Leone (USA) accumulated eight faults in 42.01 seconds for 10th place. Schuyler Riley (USA) and Lapacco, owned by South Beach Stables, were the next to go clear. They set a time of 43.79 seconds and finished in third place. Andrew Bourns (IRL) and his own Gowran Park had one rail down in 46.43 seconds for ninth place. Emily George (CAN) and Julie George's Quidam's Ramiro retired in the jump-off and finished in 12th place. 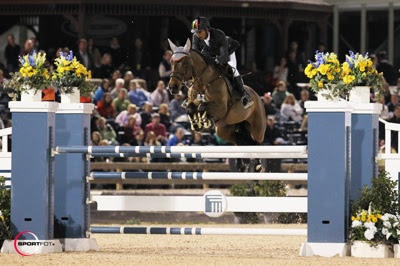 The final entry, Andres Rodriguez (VEN) and Larkanaro, had the fastest time of the night in 37.86 seconds, but an unfortunate four faults at the second to last fence relegated him to fifth place. Tomorrow is the final day of week three at the 2011 FTI Winter Equestrian Festival, and the highlight class of the day is the Suncast® 1.50m Championship Jumper Series Classic in the International Arena at 2 p.m.